This project was a retro fit on an existing kiln and included demolition of an existing grain deck floor. 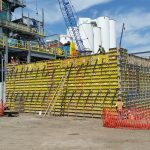 Following demolition, LPR installed a new grain deck floor and a fan building that tied into the kiln that included all the structural steel, fans, duct work, screw conveyors and piping. To install the grain deck floor, LPR had to jack up the existing floor, shore it and then install the new grain deck, drive motors and drive rings. LPR also installed a new malt handling system and dust recovery system that tied into an existing malt system and baghouse.